Register "M" refers to the memory location addressed by the HL register pair. The register pair SP is used with LXI and DAD. The register pair PSW is used with PUSH and POP. 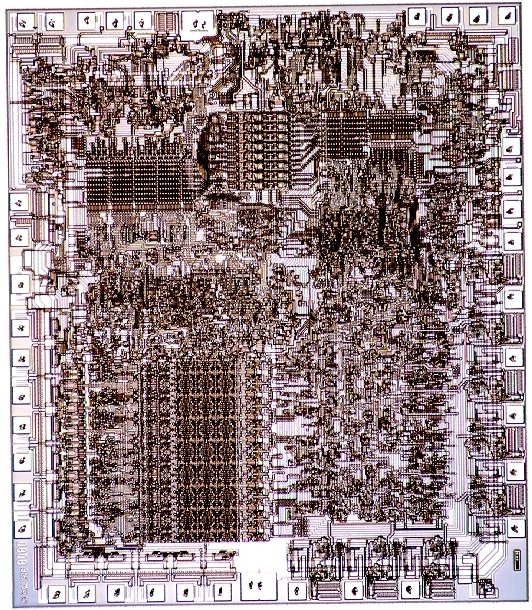 This section describes all the instuctions in the 8080A instruction set. See above for the values to substitute for sss, ddd, rp, and ccc in the descriptions below. "nnn" refers to a non-register numeric value given by the instruction operand. MOV r1,r2 01dddsss 5 none Copies the contents of register r2 to r1. MOV M,r2 01110sss 7 none Copies the contents of register r2 to the byte addressed by the (HL) register pair. MOV r1,M 01ddd110 7 none Copies the contents of the byte addressed by the (HL) register pair to r1. MVI r1,data 00ddd110 7 none The content of the 2nd byte of the instruction (immediate data) is copied into the named register. MVI M,data 00110110 10 none The content of the 2nd byte of the instruction (immediate data) is copied into the byte addressed by the (HL) register pair. LXI rp,data 00rp0001 10 none The content of byte 2 and 3 of the instruction (immediate data) is copied into the named register pair. LDA addr 00111010 13 none The content of the memory byte addressed by bytes 2 and 3 of the instruction are copied to register A.
STA addr 00110010 13 none The content of register A is copied to the memory byte addressed by bytes 2 and 3 of the instruction. LHLD addr 00101010 16 none The content of the word (16 bits) at the address in bytes 2 and 3 of the instruction are copied to the HL register pair. SHLD addr 00100010 16 none The content of register pair HL are copied to the word (16 bits) at the address given in bytes 2 and 3 of the instruction. LDAX rp 00rp1010 7 none The content of the byte at the address found in the register pair (BC or DE only) is copied to register A.
STAX rp 01rp0010 7 none The content of register A is copied to memory at the address found in the register pair (BC or DE only). XCHG 11101011 4 none The contents of the HL and DE register pairs are swapped. ADD r 10000sss 4 Z,S,P,C,AC The register is added to register A. ADD M 10000110 7 Z,S,P,C,AC The byte addressed by the (HL) register pair is added to register A.
ADI data 11000110 7 Z,S,P,C,AC Instruction byte 2 (immediate data) is added to register A.
ADC r 10001sss 4 Z,S,P,C,AC The register and the Carry flag are added to register A.
ADC M 10001110 7 Z,S,P,C,AC The byte addressed by the (HL) register pair and the Carry flag are added to register A.
ACI data 11001110 7 Z,S,P,C,AC Instruction byte 2 (immediate data) and the Carry flag are added to Register A.
SUB r 10010sss 4 Z,S,P,C,AC The register is subtracted from register A.
SUB M 10010110 7 Z,S,P,C,AC The byte addressed by the (HL) register pair is subtracted from register A.
SUI data 10010110 7 Z,S,P,C,AC Instruction byte 2 (immediate data) is subtracted from register A.
SBB r 10011sss 4 Z,S,P,C,AC The register and the Carry flag are subtracted from register A.
SBB M 10011110 0 Z,S,P,C,AC The byte addressed by the (HL) register pair and the Carry flag are subtracted from register A.
SBI data 11011110 7 Z,S,P,C,AC Instruction byte 2 (immediate data) and the Carry flag are subtracted from register A.
INR r 00ddd100 4 Z,S,P,AC The register is incremented. Note that Carry is not affected. INR M 00110100 10 Z,S,P,AC The byte addressed by the (HL) register pair is incremented. Note that Carry is not affected. DCR r 00ddd101 4 Z,S,P,AC The register is decremented. Note that Carry is not affected. DCR M 00110101 10 Z,S,P,AC The byte addressed by the (HL) register pair is decremented. Note that Carry is not affected. INX rp 00rp0011 5 none The register pair is incremented as a 16-bit number. DCX rp 00rp1011 5 none The register pair is decremented as a 16-bit number. DAD rp 00rp1001 10 C The register pair is added to the HL register pair. (1) If the value of the least significant 4 bits of register A is greater than 9 or if the AC flag is set, 6 is added to the accumulator. (2) If the value of the most significant 4 bits of register A is now greater than 9 or if the C flag is set, 6 is added to the most significant 4 bits of register A.
ANA r 10100sss 4 Z,S,P,C,AC The register is anded with register A.
ANA M 10100110 7 Z,S,P,C,AC The byte addressed by the (HL) register pair is anded with register A.
ANI data 11100110 7 Z,S,P,C,AC The 2nd byte of the instruction (immediate data) is anded with register A.
XRA r 10101sss 4 Z,S,P,C,AC The register is exclusive-or'd with register A.
XRA M 10101110 7 Z,S,P,C,AC The byte addressed by the (HL) register pair is exclusive-or'd with register A.
XRI data 11101110 7 Z,S,P,C,AC The 2nd byte of the instruction (immediate data) is exclusive-or'd with register A.
ORA r 10110sss 4 Z,S,P,C,AC The register is or'd with register A.
ORA M 10110110 7 Z,S,P,C,AC The byte addressed by the (HL) register pair is or'd with register A.
ORI data 11110110 7 Z,S,P,C,AC The 2nd byte of the instruction (immediate data) is or'd with register A.
CMP r 10111sss 4 Z,S,P,C,AC The register is subtracted from register A and the result discarded; register A remains unchanged. The flags are set based on the result of this subtraction. CMP M 10111110 7 Z,S,P,C,AC The byte addressed by the (HL) register pair is subtracted from register A and the result discarded; register A remains unchanged. The flags are set based on the result of this subtraction. CPI data 11111110 7 Z,S,P,C,AC The 2nd byte of the instruction (immediate data) is subtracted from register A and the result discarded; register A remains unchanged. The flags are set based on the result of this subtraction. CMA 00101111 4 none The contents of register A are complemented: the 1 bits become 0 and the 0 bits become 1. CMC 00111111 4 C The Carry flag is complemented. STC 00110111 4 C The Carry flag is forced to 1. JMP addr 11000011 10 none Control is passed to the instruction at the given address. J(condition) 11ccc010 10 none If the specified condition is true, control is passed to the instruction at the given address. CALL 11001101 17 none The next instruction address is pushed on the stack. Then control passes to the instruction at the given address. C(condition) 11ccc100 11/17 none If the specified condition is true, the next instruction address is pushed on the stack. Then control passes to the instruction at the given address. RET 11001001 5 none Control is passed to the address that is popped from the stack. R(condition) 11ccc000 5/11 none If the specified condition is true, control is passed to the address that is popped from the stack. PCHL 11101001 5 none The contents of register pair HL are copied to the program counter, effectively passing control to the instruction at the address in HL. PUSH rp 11rp0101 11 none The named register pair is pushed onto the stack. POP rp 11rp0001 10 (note) The named register pair is popped off of the stack. XTHL 11100011 18 none The contents of the HL pair are swapped with the 16-bit value at the top of the stack. SPHL 11111001 5 none The contents of the HL pair are copied into the SP pair. IN port 11011011 10 none The port named in the 2nd byte of the instruction (immediate data) is read and the data placed in register A. OUT port 11010011 10 none The data in register A is written to the port addressed in the 2nd byte of the instruction (immediate data). EI 11111011 4 none The interrupt system is enabled, following the execution of the next instruction. DI 11110011 4 none The interrupt system is disabled immediately. HLT 01110110 7 none The processor is halted. This condition persists until the next interrupt. NOP 00000000 4 none No operation is performed. Where there are two values for cycles, the first is for the false condition and the second for the true condition. Note: A POP instruction naming the BC, DE, or HL register pairs has no effect on the flags. A POP instruction naming the PSW affects all flags.